As early as 1855, Fayetteville city leaders had recognized the potential profit and growth that railway connections would bring to the rest of the county. The rugged Ozark terrain isolated their fledgling village, making commerce difficult and expensive for necessities and luxuries alike. Goods came north by ox cart from the Arkansas River at Van Buren or Ft. Gibson, or south from the railhead in Missouri. After the Civil War, in 1868 Arkansas legislators passed a bill granting aid to railroads which in turn prompted the St. Louis and San Francisco to start laying track south from Springfield, Missouri. The Frisco line made it to Fayetteville in 1881 with passenger service delayed until the completion of the Winslow tunnel. On July 4, 1882, a brass band and a crowd of 10,000 greeted the first passenger train at the Fayetteville Dickson Street station. Winslow railroad tunnel circa 1885. Courtesy Arkansas Railroad Museum. All kinds of goods traveled along the new line from Monett, Missouri to Fort Smith—product of a fourteen-year construction effort—encouraging the hopes of men and families seeking livelihood. The most plentiful and profitable local raw material available for the taking were the old-growth trees. Land sold for $1 per acre with an estimated available merchantable timber of 5000 board feet per acre. A flourishing trade blossomed along the track as virgin forest fell to the hands of hardworking men. Within the first decade after 1882, West Fork, Woolsey, Brentwood, Winslow, and several long-since vanished whistle stops became boom towns where railroad ties, fence posts, and rough-cut lumber were loaded onto railcars. One of the most ambitious men to exploit the timber trade was Hugh F. McDaniel, a railroad builder and tie contractor who had come to Fayetteville along with the Frisco. He purchased thousands of acres of land within hauling distance of the railroad and sent out teams of men to cut the timber. By the mid-1880s, after a frenzy of cutting in south Washington County, he turned his gaze to the untapped fortune of timber on the steep hillsides of southeast Washington County and southern Madison County, territory most readily accessed along a wide valley long since leveled by the east fork of White River. Mr. McDaniel gathered a group of backers, petitioned the state, and was granted a charter September 4, 1886, giving authority to issue capital stock valued at $1.5 million. This was the estimated cost to build a rail line through St. Paul and on to Lewisburg, which was a riverboat town on the Arkansas River near Morrilton. McDaniel began surveys while local businessman J. F. Mayes worked with property owners to secure rights of way. “On December 4, 1886, a switch was installed in the Frisco main line about a mile south of Fayetteville, and the spot was named Fayette Junction.” Within six months, 25 miles of track had been laid east by southeast through Baldwin, Harris, Elkins, Durham, Thompson, Crosses, Delaney, Patrick, Combs, and finally St. Paul. Soon after, in 1887, the Frisco bought the so-called “Fayetteville and Little Rock” line from McDaniel. It was estimated that in the first year McDaniel and partners shipped out more than two million dollars’ worth of hand-hacked white oak railroad ties at an approximate value of twenty-five cents each. Mills ran day and night as people arrived “by train, wagon, on horseback, even afoot” to get a piece of the action along the new track, commonly referred to as the “St. Paul line.” Saloons, hotels, banks, stores, and services from smithing to tailoring sprang up in rail stop communities. As the Fayetteville & Little Rock track extended to Dutton and its final easternmost point at Pettigrew in 1897, local sawmills processed massive logs of oak, walnut, maple, and hickory into rough lumber before it was loaded onto the railcars. “Wagons loaded with hardwood timber—cross ties, fence posts, rives, felloes, sawed lumber to be finished into buggy and wagon wheels and spokes, single trees, neck yokes, handles for hammers and plows, and building materials” streamed into the rail yards along the St. Paul line. Overnight, men became wealthy according to their ability to take advantage of the timber trade. With the railroad came enormous population growth and the need for more homes, churches, offices, and commercial enterprise. Sufficient supply of building materials depended upon ever more distant timber harvest and upon the increasingly mechanized production of lumber. This frenzy of lumber and milling enterprises fed off the forests of southern Washington and Madison counties, with mills and factories located at various sites around Fayetteville. White oak was preferred for railroad ties, while red oak was the resilient wood of choice for wagon stock, especially bows, hubs, and spokes. Other woods milled included walnut, hickory, ash, and cherry. All the timber from points east and south came through Fayette Junction where railroad crews tended the engines, hooked up or dropped off cars on the sidings, threw appropriate switches, and communicated by telegraph, written messages, and word of mouth with various station agents about activities along the tracks. Serving as conductor along the early St. Paul line required a special breed of man, epitomized by the fabled “Irish” John Mulrenin who took on the job after three predecessors had quit in quick succession. For the next thirty years he handled the passengers of the St. Paul line, not just families and businessmen but backwoods lumberjacks and diamond-jeweled card sharks. He became skilled in quick decisions such as cutting short the Pettigrew switching chores to leave drunks stranded at the depot. 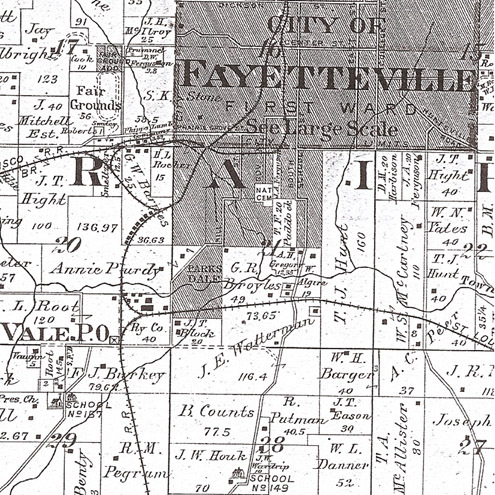 Circa 1890 map of Fayetteville Arkansas and the railroad ‘wye’ at Fayette Junction. 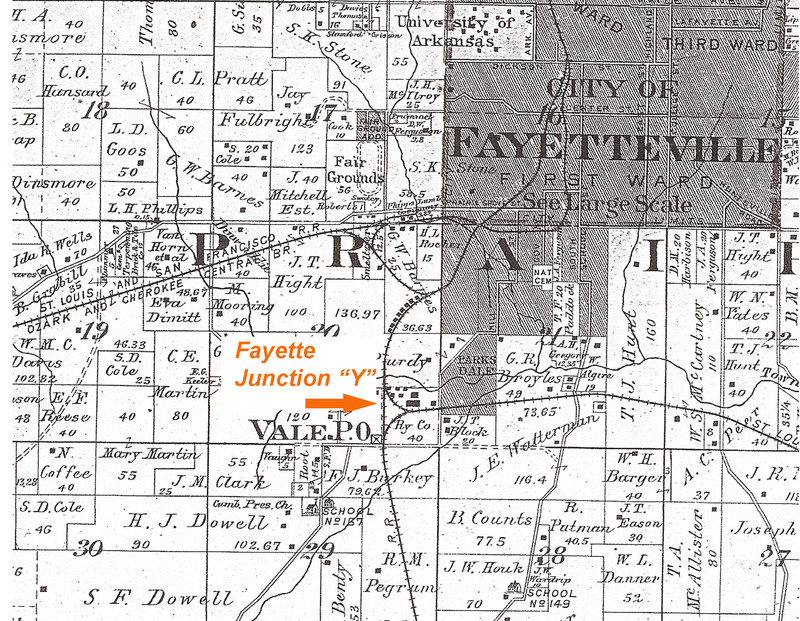 The Fayette Junction tracks formed a “Y”, with the southern “wye” used for “storage” and the northern for “industry”. Where the northern “wye” joined the main track near the northernmost point of present-day Vale Avenue, there was a gravel platform, water tank, and depot, although there was never a passenger depot at Fayette Junction. Inside the “Y,” Frisco built mechanical department buildings including a shop and storeroom, an 813 foot long “cinder pit” track, and a 416 foot long “depress” track, according to the 1916 Frisco map. At the southern end of the “Y” was a coal chute track, a coaling plant, boiler room, and a sand house. 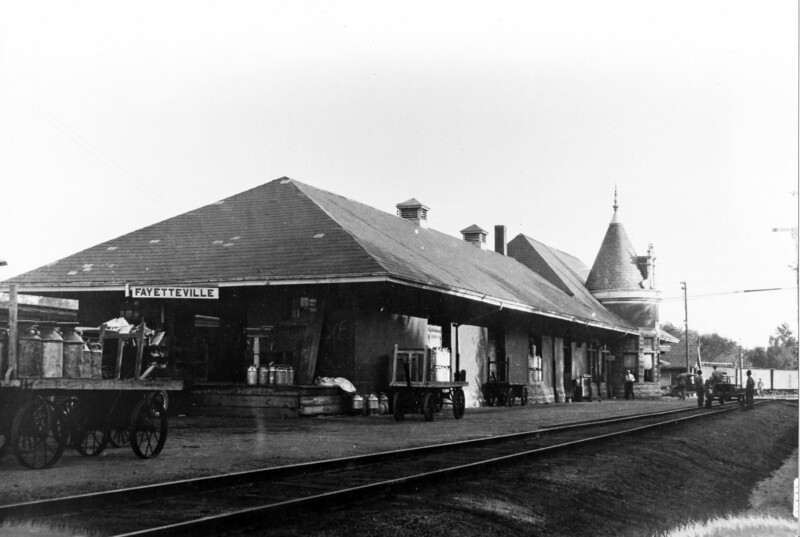 The November 19, 1905 train schedule from Fayetteville to Pettigrew left the Dickson Street station at 8:10 a.m., passed through Fayette Junction at 8:40 a.m., and arrived at Pettigrew at 11:50 a.m., with stops at Baldwin, Harris, Elkins, Durham, Thompson, Crosses, Delaney, Patrick, Combs, Brashears, St. Paul, and Dutton. After turning the engine on the roundhouse at Pettigrew, the train departed at 12:55 p.m., and arrived at Fayetteville at 4:15 p.m. In 1915, the train ran approximately fifteen minutes earlier, with the stop at Baldwin now named “Leith.” Return run arrived in Fayetteville at 3:30 p.m. The same schedule and stops were in place in 1927. The Frisco Fayette Junction Roundhouse was listed in the 1932 Fayetteville directory with a telephone number of 641 under “Railroads” in the Yellow Pages. The Personal Data Book of the Division Superintendent for the Ft. Smith station reported the Fayette Junction population that year was fifty, but it is not clear what area he considered “Fayette Junction.” Three years later, Superintendent S. T. Cantrell inventoried the 75 steam engines and other assets of the division. The oldest engine of the bunch, a “ten-wheeler” No. 488 Baldwin 1910, was in mixed service on the St. Paul to Bentonville line. 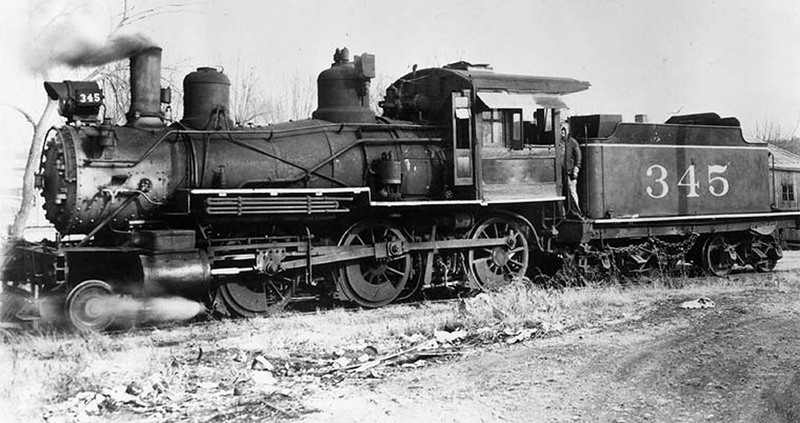 Also in use to St. Paul was another oil-burner 4-6-0, No. 552 Pittsburgh 1901. Cantrell reported the following locomotive assignments to Fayette Junction as of February 26, 1935. In the shop: #598, 4-6-0, oil, Dickson 1903. In storage: #648, 4-6-0, oil, Baldwin 1904; #750 4-6-0, oil, Baldwin 1902; #755, 4-6-0, oil, Baldwin 1902; #779 4-6-0, oil, Baldwin 1903; #3651 0-6-0, oil, Baldwin 1906; #3676 0-6-0, coal, Baldwin 1905#3695 0-6-0, coal, Baldwin 1906. Later observers remarked on the number of engines in storage as evidence of the “sorry state” of the railroads by 1935. The Fayette Junction station force in 1932 included an agent-telegraph operator working 6 a.m. until 3 p.m., with a stipend of $0.67 per day. Holidays the hours were 6:15 a.m. until 8:15 a.m. The schedule by 1931 for ‘St. Paul Branch’ showed a mixed train daily (passengers and freight), starting from Fayetteville at 7:45 a.m., arriving Pettigrew at 11a.m., leaving Pettigrew at 12:01 p.m. to return to Fayetteville, where it arrived at 3:10 p.m. All the intermediate stations were shown as flag stops except for Combs, where the train stopped at 9:54 a.m. on the outbound trip and 12:50 p.m. on the return trip, and St. Paul at 10:15 a.m. on the outbound trip and 12:30 p.m. on the return trip. The fifty years from 1887 to 1937 had seen it all come and go through Fayette Junction. According to favored accounts, the last train to St. Paul ran July 30, 1937, “when ‘Irish’ Mulrenin had in his charge one wheezing locomotive, Mogul #345, and one empty, creaking old wooden coach” with a crate of two hound dogs for passengers. The logging boom had come to an end. The tracks were taken up some time after, but remained across south Fayetteville accommodating various manufacturers in the new Fayetteville industrial park (east of City Lake Road, south of Hwy 16 East) and the shipment of new and recycled metal to and from Ozark Steel Company on South School as late as the 1970s. This a condensed excerpt from my article on Fayette Junction, a location in South Fayetteville (Washington County, Arkansas) where the 1880s logging boom centered. For the full article, look for my book Glimpses of Fayetteville’s Past, available in local bookstore or at Amazon. Hugh McDanield, b 1843 to B. F. and Sarah (Terrell), fought for the Union in the Civil War, worked in mercantile trade in Kansas City until 1873, built the Kansas Midland Railway from Kansas City to Topeka, and then operated a ranch in west Texas. After completing the Texas Western Railway in 1877, he turned his attention to Northwest Arkansas and began selling ties in 1881. He bought, logged, and sold thousands of acres of Washington County land and later Madison and Franklin counties over the next seven years and made a fortune furnishing the Santa Fe Railway nearly all its ties for the railroad west. He is credited as founder of St. Paul by the 1889 Goodspeed. He died at age 45 (1888) in Fayetteville of a month-long, unnamed illness. Backers included F. H. Fairbanks, J. F. Mayes, and J. S. Van Hoose, along with McDaniel’s brother J. S. McDaniel, all of Fayetteville, and D. B. Elliott of Delaney, J. Pickens of Eversonville, Missouri, J. W. Brown of Brentwood, and another brother, B. F. McDaniel of Bonner Springs, Kansas. This entry was posted in Local History and tagged 1880s, Arkansas, early America, Fayetteville, logging boom, Ozarks, railroad, timber, virgin forest, westward development on December 22, 2015 by Denele Campbell.